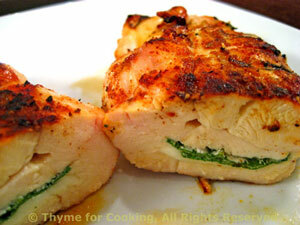 Chicken Breasts Stuffed with Mozzarella and Basil, Thyme for Cooking. Slice the mozzarella as thinly as possible, divide and fit into each pocket. Place the basil on top of the cheese, folding it in to fit. Wrap entire breast with kitchen string to hold it together. Put all ingredients for sauce in a bowl and whisk well to combine.